Force feedback steering wheels are brilliant and absolutely enrich the experience of playing racing games. The problem is, they tend to have a modest diameter and quality that leaves people thinking you've blown money on the equivalent of a kids' toy. We'll admit, the brightly colored buttons don't help. Fanatec's new McLaren GT3 rim for Xbox and PC, however, looks like it was ripped directly from the mitts of our own Chris Harris mid-stint at the Spa 24 Hours. 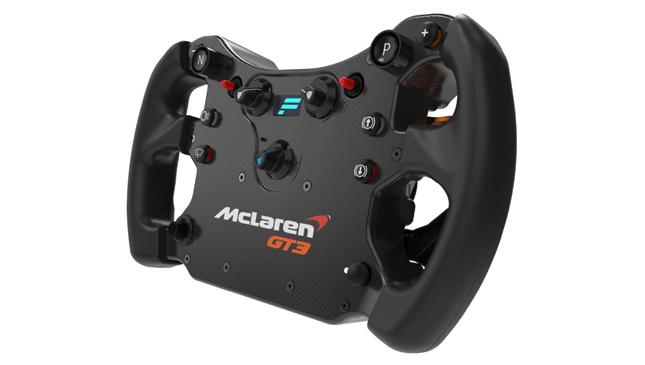 The Fanatec CSL Elite Steering Wheel McLaren GT3, to give it its full title, is a convincing life-sized replica of the steering wheel from the McLaren 650S GT3 racer and would look just as good on the mantlepiece as it does clamped to your computer desk. Wrap your paws around the rubberized grips and it also feels every bit the part with chunky anodized aluminum shifter paddles that are endlessly pleasing to tug and a plethora of buttons, rotary switches and toggles that all click into place with a deeply satisfying action. Even when you're just sitting in a loading screen you'll find yourself idly twiddling and prodding things just for the tactile kicks. In particular, the neutral and pit limiter buttons apparently have the same raised bevel and stiff resistance as the real thing, ensuring you don't, for example, accidentally zero the gearbox in the middle of a fast right-hander. 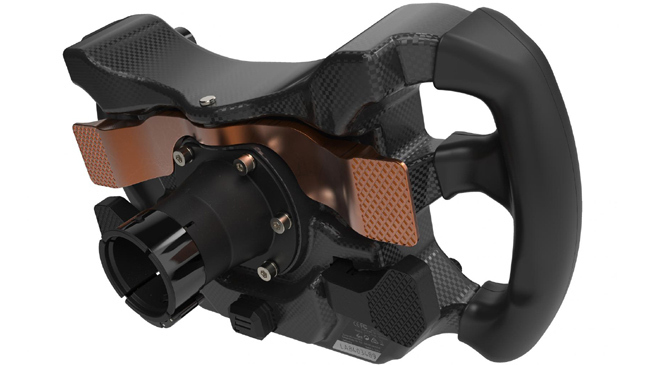 A pair of springy analog clutch paddles allows for realistic launches, but can also be reconfigured to act as clutch and handbrake or even throttle and brake, if for whatever reason you're unable to use the pedals. The wheel's also surprisingly light, in spite of its proportions, meaning the only forces you're wrestling with are the ones being transmitted from the simulation itself. In order to use this McLaren rim at all, though, you'll need some of the existing Fanatec equipment, namely a separate wheelbase (containing the force feedback motor) and some pedals. This wheel is compatible with the Clubsport V2, V2.5 and the CSL Elite wheelbases, and our CSL Elite model offers arm-wrenchingly robust but unerringly smooth force feedback that deftly avoids the slightly buzzy or notchy feel we're used to on other wheels. We're also a fan of the authentically blinding shift lights. Our optometrist? Less keen. Be warned, Fanatec gear isn't exactly cheap. Our setup, including the McLaren GT3 rim itself will set you back just north of £500 (P35,000) when it goes on sale in early June, but everything feels reassuringly well-engineered and there's a lot to be said for the psychological effect of having a full-sized race wheel in your hands. The thing was designed based on McLaren's own CAD files, so if the goal is increased authenticity and immersion, it doesn't get a lot better than this.